Musings 'n scribblings of a philanthrope .. : A3 thinking .. 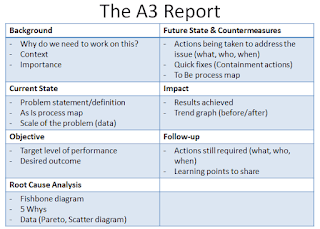 The A3 thinking is based on the Deming Plan-Do-Check-Act (PDCA) cycle. 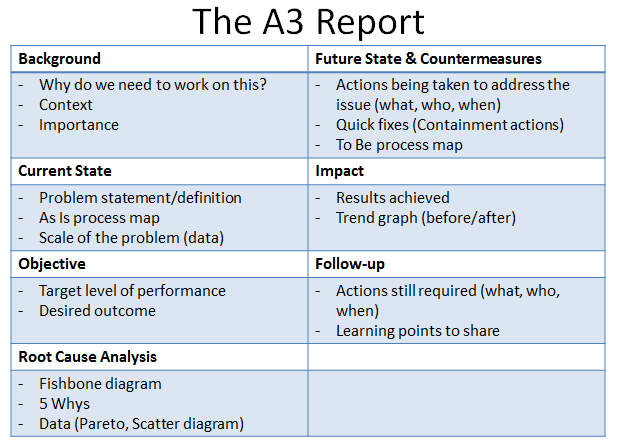 A3 is a structured problem solving and continuous improvement approach, first employed at Toyota and typically used by lean manufacturing practitioners. The A3 approach is divided into a number of steps which can vary. Most often, eight (8) problem-solving steps are used. Mapping out for this step can be driven by a set of questions. For example, the "5 W's (what, where, when, why, who) and 2H's" (how, how many). These steps are followed by follow Up actions. Planning gets pride of place and it shows how important is planning in the whole quality improvement process. It is said that on an average a Toyota executive spends about 70% of his time planning and only 30 % in execution and monitoring. Click here for my earlier writing on the PDCA cycle ..